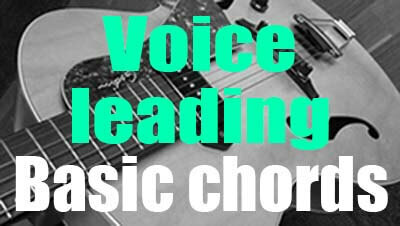 "Voice leading" is a term that refers to the smooth progression of each voice of a chord. This technique consist to move individually one or several voices up or down by a step from one chord to the next. Voice leading is very used by composers and improvisers in order to connect chords instead of bouncing them around. The aim of this lesson is to connect or voice-lead basic four-note chords by moving only one voice. This technique is very fun and should help you learn some of the most important chords used in jazz guitar. The chords in the five following exercises below are voice led so that only one voice moves at a time. In this first example, we will be playing four drop 3 chords : G major (G-B-D), G major 7 (G-B-D-F#), G7 (G-B-D-F) and G6 (G-E-B-D). The common voices in all four chords are G (root), B (major third) and D (fifth). It means that the root, the major third and the fifth from G major to G6 will be retained. You can notice that the root of G moves down to the major 7 of Gmaj7 (F#), then F# moves down to the minor seventh of G7 (F), which moves down again to the sixth of G6 (E). Here we will use four minor chord voicings, G minor (G-Bb-D) whose root goes to the major seventh of GminMaj7 (F#), which moves to the minor seventh of Gm7 (F), which goes down to the sixth of Gm6 (E). Once again we will keep the same root, minor third and major seventh. Four dominant voicings are used in this exercise. G7b5, G7, G7b13 and G13. They all contain the same root (G), the same third (B) and the same minor seventh (F). The first chord is G dominant flat five, the b5 moves up to the perfect fifth of G7, which moves up to b13 of G7b13 and moves up once again to the thirteenth of G13. Let's take four voicings from the minor chord family. Gm7 (G-F-Bb-D) which is a drop 3 voicing (root position), Gm7b5 (G-F-Bb-Db), Gdim7 (G-E-Bb-Db) and Gm6add11 (G-E-Bb-C). The fifth of Gm7 moves down by a half-step to the diminished fifth of Gm7b5. Then, the minor seventh of G-7b5 (F) moves down to the diminished seventh of Gdim7 (E) while keeping the root (G), the minor third (Bb) and the diminished fifth (Db). In bar two, the diminished fifth of Gdim7 (Db) moves down to the eleventh of Gm6add11 (C). For this last example we will be playing four dominant chords. The basic idea is to move step by step the root of the first dominant seventh drop 2 voicing in order to get three different dominant ninth chords, one with a flat nine (b9), one with a non-altered ninth (9) and one with a raised ninth (#9), best known as "The Hendrix chord". So, the root of G7 moves up to the b9 of G7b9 (Ab), which goes down to the ninth of G9 (A), whic moves down to the #9 of G7#9. This infographic with neck diagrams lists and shows the main drop 2 guitar chords used in jazz music by composers, arrangers or soloists. These chords are divided into 5 types that are minor seventh, major seventh, dominant seventh, half-diminished and diminished seventh.